My selection is a classic picture book from 1939…kids love hearing it as much as they did over 70 years ago when it was first published! Since Valentine’s Day is just around the corner, I’ve chosen a craft that parents and/or teachers might want to try with their children. Synopsis: Little Toot spends his days “playing” in New York City harbour, getting in the way of the other tugboats that are working hard. The little tugboat enjoys sailing in figure-eights and blowing big smokeballs. While his father and grandfather,famous for their strength and bravery, work diligently, Little Toot fools around. The entire fleet of tugboats despair that Little Toot will ever learn to do the job he was born to do. However, when a big ocean liner gets into trouble during a storm, Little Toot must decide if he will continue his childish antics or rise to the occasion and save the day? Growing up is a difficult task. Children often hear parents and teachers exclaim, “When will you grow up and act your age?” Just like Leo the Late Bloomer, Little Toot helps parents realize that their children will mature in their own unique time. The story also gives hope to young children that they will master those tasks and skills they are challenged with now and shows them how Little Toot was able to channel his energy in a positive way. The book is filled with Mr. Gramatky’s beautiful watercolor illustrations and the text is perfectly simple and simply perfect! The reader and listener are drawn into the drama on the high seas…will Little Toot be able to rescue the ocean liner? 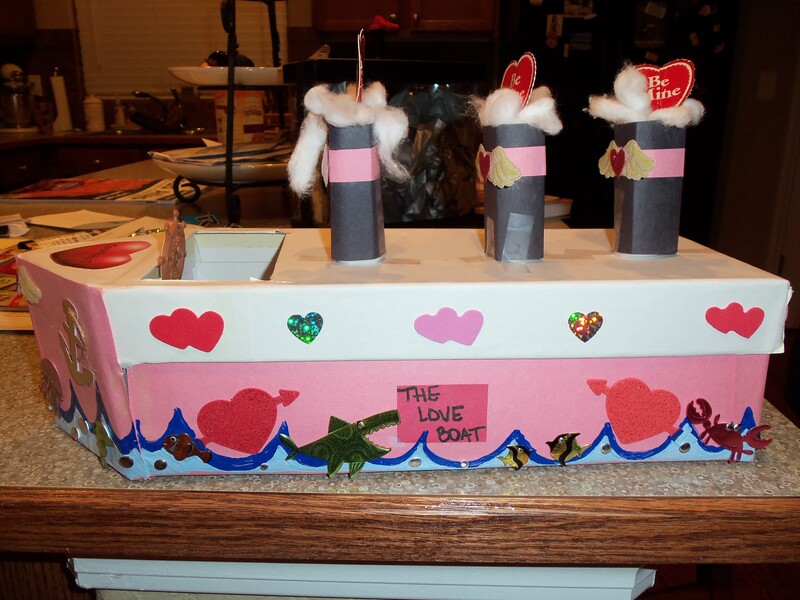 Since Valentine’s Day is just around the corner, how about making a Tugboat Valentine Box for your child to store all of his or her Valentine cards. My thanks to Courtney, one of my coworkers, who made this awesome Valentine Boat. You will need: Shoebox with lid, piece of cardboard (from cereal box or men’s dress shirt), construction paper, markers or crayons, white school glue or glue stick, scissors, Valentine stickers (optional…you can always cut the out of construction paper). 1. Cut the piece of cardboard to fit the front of the bottom of the box as the “bow” of the boat. Glue in place. 2. Cut a hole in the lid for the “mail” slot. 3. Cover the outside of the box and the lid with construction paper and glue in place. 4. Cut several strips of paper and roll to form the smoke-stacks. Glue in place. 5. Add the decorations and designs with markers, crayons and stickers. This entry was posted in children's picture books, Crafting with Children, Perfect Picture Book Friday, Reading with Children and tagged Hardie Gramatky, Little Toot, Picture book, Valentine's Day by viviankirkfield. Bookmark the permalink. What a wonderful classic. 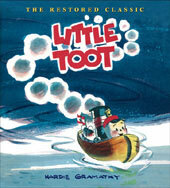 I remember “Little Toot!” A book that has been passed down through many generations. He may have been a little tug boat, but he carried a big message. You always have the best activities. Kids will have so much fun making their own Little Toot. Great Friday PPB choice. Thank you so much, Pat. Glad you liked the choice and the activity. What a cute story, a nice lesson and a fabulous craft. I wonder if my kids want to do that this weekend. Thanks a lot. You’ve got to love shoeboxes. 🙂 I can remember sitting at the kitchen table with my mom, making a diorama for school. All the people where I work made shoebox valentine boxes…what fun! I’ll try to get a picture or two of all of them…it’s amazing how creative people can be. Oh, I hope you can find it! It is a wonderful story…a true classic from 1939, but the messages are still relevant and the story and illustrations are still enjoyed by kids today. I have never heard of this story. How awesome that it is still so relevant and appealing 70 years later! You have amazing coworkers, that are prepared to make valentines tugboats for fun! Great activity! 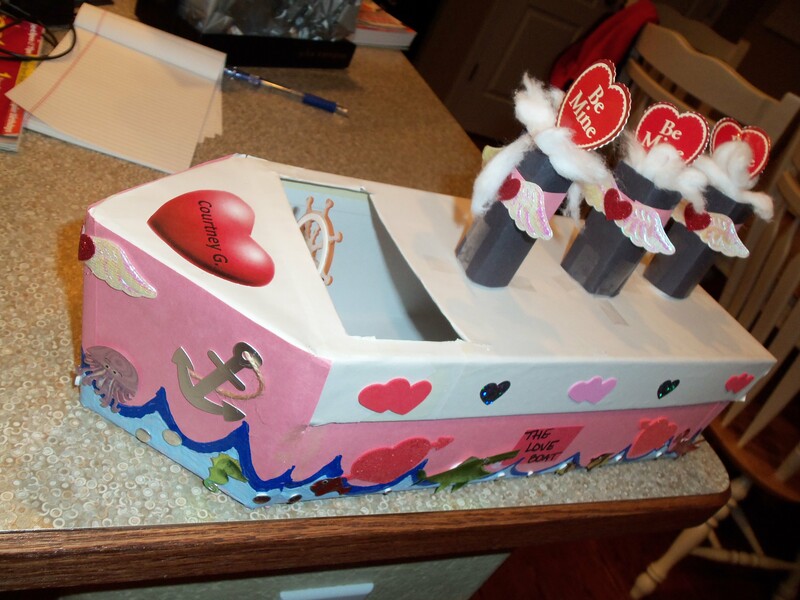 I appreciate your kind words about the craft…all of my co-workers made a Valentine box…it was amazing how many different ideas there were…the boat was done by one of the young ladies and she graciously said I could use it in my PPBF post. I’m going to try to post a couple of pics of the other boxes…great ideas for any parent or teacher. I know there are many newer editions…but you can always check half.com and Amazon…I’m pretty sure you will find some copies. The Valentines tugboats are so cute. Also, the cover illustration is beautiful. Thanks for bringing this book to my attention. This looks adorable book, with an interesting plot. Thanks for sharing your review and fun craft activities for the kids. How fun to incorporate a Valentine’s Day activity with this picture book, and one that both boys and girls are sure to enjoy! Thanks for sharing. So glad you stopped by. I’m happy you liked the book choice and craft…shoe boxes are very versatile…I never throw any away. If a teacher has a craft project that needs lots of shoe boxes, she can always go to a local department store and ask if they will save them for her. Oh, Vivian, I love the tugboat and this is so wonderful reading your love for Little Toot. My dad wrote and illustrated it back in 1939 (he died in 1979 at only 72 years of age), and the GREAT news is that it definitely is still in print! In 2007, my husband and I showed the editors at G. P. Putnam’s (Penguin) a first edition of Little Toot, and they decided to rescan the artwork and thus was born the colorful “restored classic edition” that you show in the blog. We were able to add 9 additional full color sketches because back in the Depression, the publisher needed a bunch of black and white illustrations. Thanks to everyone for their kind comments, and hopefully Little Toot will turn out to be a favorite children’s book for your children and grandchildren. And the watercolors you so kindly mention, Vivian? It turns out that 67 years after Little Toot was published (and Dad had had a long career with both children’s books and fine art painting), Andrew Wyeth named him as one of the “20 all-time great American watercolorists”, along with Winslow Homer and Edward Hopper. Wouldn’t he have been amazed? So the artwork in Little Toot is definitely special, and so many people tell me that they never forgot the artwork in Little Toot. As I scrolled down the comments tonight, I saw your name and my heart did a flip-flop, Linda. I recognized the “Gramatky” and I couldn’t believe you had stopped by. Thank you so much! Little Toot has always been one of my favorites…I grew up in NYC, right across the street from the East River, so New York harbour is part of my childhood memories. Your dad’s story and illustrations have entertained and encouraged many generations of children…I know you are very proud of all that he accomplished. Thank you for adding the other website where people can find your dad’s watercolors. Many of the people who participate in Susannah Leonard Hill’s Perfect Picture Book Friday are picture book illustrators. And please don’t apologize for “talking too much”…it was wonderful having you…might you be interested in doing a guest interview (kind of a Q&A on my blog about your dad’s work…or anything else you might want to talk about that pertains to picture books and children)? You can email me at vivian@positiveparentalparticipation.com. I hope you come back again to visit! That tugboat Valentine’s box is too precious! So glad you liked it, Kirsten! I wish I could take credit for it…but one of my co-workers made that one and graciously allowed me to use it for the post because it tied in so well with the boat theme. 🙂 I will be posting pictures of some of the other Valentine boxes…mine included. Oh, I have to get this book from the library. I’m sure the kids will like it. They always say they want to grow up and be bigger but don’t realize it also comes with bigger responsibilities. Glad you liked the book choice…it is a sweet and special story. Oh, this is a good one and I love what you said about helping parents realize that kids will mature in their own time. Everyone develops at a different rate! Thank you. I read this on Friday (the craft impressed me), thought I commented, but glad today I found myself reading through the comments. How lovely the author’s daughter shared about her father’s work. I so appreciate you taking the time to stop by and read and comment…how do you find the time? I need to go back to your blog and grab that awesome button if I can…the dragon one…don’t know how many posts I will be able to link up…but I was blown away with the graphic! Glad you liked the story and review. 🙂 I love the old classic picture books…although I think many of the newer ones are awesome! I really like your valentines day craft! Cool box! Thanks for stopping by, Erik. Glad you liked the craft…it is a cool boat…my co-worker did a great job! I’ll be taking pics of all the boxes they decorated at work…and I’ll post them on Valentine’s Day, I think. What a cute little Valentine box. I’ll have to keep this in mind for my grandchildren next year.